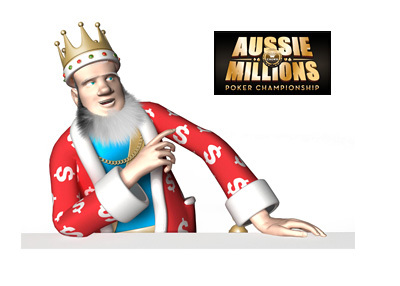 Chance Kornuth managed to outlast Igor Kurganov earlier this weekend to take down the Aussie Millions $25,000 Challenge for $790,560 AUD. With his victory, Chance Kornuth now has over $3.2 million in total lifetime tournament earnings. Day 1 of the $100,000 Challenge wrapped up last night with Brian Rast (378,500 in chips) and Stephen Chidwick (378,500) finishing in a tie for the chip lead. A total of 29 players turned out for Day 1 of the event - with 8 re-entries, the field size was sitting at 37 at the end of Day 1, down significantly from last year. That number is expected to rise, however, as players such as Phil Ivey are expected to buy in for the start of Day 2. Ivey, who has enjoyed a great deal of success in the past in this event, was eliminated on Day 1, along with the likes of John Juanda, Antonio Esfandiari and John Juanda. The final prize pool numbers for this event won't be known until registration closes on Day 2.